SAN LUIS OBISPO, CA (Nov. 14, 2018)—Early stage software developer and technology consultancy BizWatt, LLC announces the formation of its board of advisors. Jeremy LaDuque, COO of Online Image and multi-unit franchise owner, has founded and lead technology companies for 20 years. Prior to Online Image, a software provider to franchise and multi-unit organizations, he founded ElementsLocal, acquired by Bridgeline Digital (NA: BLIN). To BizWatt, he brings an extensive background in taking SaaS companies to market, executing market strategies and acquiring and managing large scale enterprises such as Luxottica, UPS Stores, and Twitter. Jeshua Borges, senior architect with Pocket, a Mozilla company, has led engineering teams on large scale applications such as Bebo, which sold to AOL. Borges also started and sold multiple software companies and sits on the boards of startup and mid-stage companies. Sean Collier, COO of Etna Interactive, has taken several startups from idea stage to global organizations. As VP of Global Sales Engineering at Kibo Commerce and Chief Customer Advocate at Shopatron, he focused on customer experience through repeatable, scalable operations. As a digital cloud software leader, Collier served as a board advisor, investor, founder, and product manager. To BizWatt, he brings his belief that strong financial discipline, teamwork, and alignment across stakeholders drives the highest returns with the lowest risk. Founded in 2016 by Fred Dyste, BizWatt, LLC developed Qfactor™ for Land Surveyors, a leading proposal and project creation and tracking tool providing status and profitability reporting by integrating with time entry and accounting software allowing for data to be entered once and showing up where needed. SAN LUIS OBISPO, Calif (Sept. 24, 2018)—Software developer and technology consultancy BizWatt, LLC concluded its initial round of funding and announced the minimum viable product (MVP) version of their project management application, Qfactor for Land Surveyors. Currently the product is being used by land surveying firms across the United States. BizWatt, LLC closed its seed round by announcing venture capital firm Nordic American Ventures as their lead investor. According to Nordic American Ventures partner Chaz Groves, this is one of his fund’s better investments because BizWatt is exceeding expectations in product development and market penetration. In December 2017, BizWatt released the MVP version of Qfactor for Land Surveyors, a project management application tailored specifically for this industry that creates intuitive interfaces, timelines, and other project management tools by pulling data from the programs surveying firms already use, such as Google Earth, QuickBooks, and time tracking software. By doing so, it eliminates data silos and makes programs that are normally incompatible talk to one another. Qfactor for Land Surveyors uses BizWatt’s platform to deliver this service so it can be quickly and easily adapted to clients’ feedback. It works on a SaaS model, or a model in which the software is centrally hosted and licensed on a subscription basis. Dyste’s plans will further develop the product to include a proposal building feature to assist land surveyors with authoring and submitting project proposals to potential clients. Founded in 2016, BizWatt, LLC is a client-centered consultancy that helps companies break down data silos by integrating a client’s disparate applications, including their project and business management tools into an easy-to-use data ecosystem. Their tagline “because work is power over time” is a play on Ohm’s law which describes how electrical resistance turns into capacity. BizWatt believes that work is done more efficiently when you have power over time. 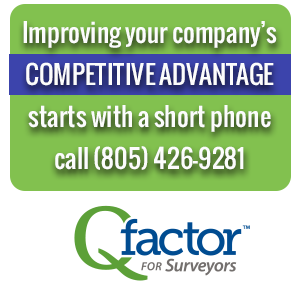 Qfactor for Land Surveyors gives you that power. BizWatt founder, Fred Dyste has over 30 years of experience working with startups, early stage, and publicly traded companies. He is able to respond to the particular needs of a diversity of companies because, over the course of his professional life, he has been involved in an array of ventures, products, and services. This gives him a broad perspective on a variety of industries and an ability to identify market niches, product needs, and implementation strategies. He can also multi-task in finance, operations, and sales & marketing and is the developer of Qfactor. Qfactor is powered by BizWatt, LLC. ©2016-2019 All rights reserved. | BizWatt branding by RobertMottDesigns.com | QuickBooks®, Salesforce® and BaseCamp® are registered trademarks of their respective companies. All rights reserved.